A very useful size, suitable for any of my canvases except Small Projects and Children’s Kits. 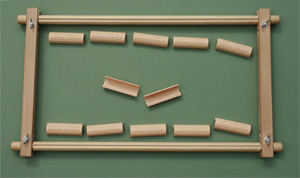 There is no need to get out your needle and thread to sew your canvas to the roller bars with a clip frame. Simply clip the canvas on and away you go without delay. Marvelous! Full illustrated instructions included in the pack.